As a book collector, I’m pleased that books will be more beautiful. As a lover of bookstores, I’m happy for anything that might help preserve them. But as a reader and writer, I’m quite indifferent. The problem with the strategy is that it won’t, as hoped, “cut into e-book sales” in a significant way. Most readers aren’t antiquarians and don’t value the physical esthetics of the container. They just want the content. In the same way, unlike book designers, most writers don’t care in a meaningful way about the physical presence of a book. They just want to tell a story, or convey information, or to create works of art out of their words. The physical format is not essential. There are a few books for which the physical medium of print matters in an essential way. House of Leaves, for instance, just wouldn’t be so mind-blowing in a leafless e-book. And is there any effective e-equivalent of a pop-up book? 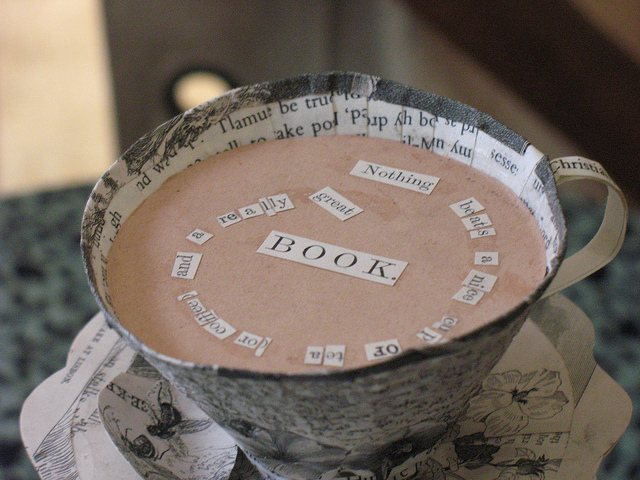 Moreover, could anyone do this with an e-book? But these instances and their like are minor eddies of activity that briefly pull print defenders upstream before they are hurtled back down, inevitably, towards the fatal digital waterfall. The effect is simply amplified when it comes to magazines (and turned up to 11 for newspapers). The physical aspects of magazines can be nice indeed, but they are rarely treasured objects. Inveterate collector though I am, I have gradually whittled down even my set of classic Wired issues from several shelves to one shelf—and only the Neal Stephenson issue is safe. I’m all for more beautiful books, but let’s be realistic. Like taxidermy, printing beautiful books may preserve glorious specimens, but it does nothing to save the species. It’s a new dawn and I’ve awakened with my usual optimism and generosity of spirit restored. Today I see things a bit differently. Magazines aren’t dying, they’re simply transmigrating. You see, the soul of a magazine is not to be found in its format. LIke every other kind of communication, a magazine is expression, transported in a vehicle. If you pay undue attention to the vehicle, the format, you’ll miss the important thing being expressed. When new-media thinkers talk about transparency, they’re usually thinking about ethics. We need to think of it in terms of expression and formats as well. The point of new media is immediacy, direct connection, and that works best when the format recedes into the background of your attention and becomes virtually invisible. This is one reason for Twitter’s success. The pared-down simplicity of its vehicle doesn’t get in the way; you focus on the words, the expression, not the technology or format. That highlights the problems with digital magazine formats so far. When you have to spend too much of your time clicking and zooming, you become too conscious of the medium, and lose sight of the message. Eventually, expression will have its way. The various urges to communicate that constitute what we think of as the magazine will find the transparency that suits them best. There are days, perhaps when my inner curmudgeon breaks through my usual resistance, when I’m convinced that magazines, as a useful format, are truly dead. Yes, it may just be me or my desperation for a topic in this month of mandatory daily blogging. Ask me tomorrow and I may feel more hopeful. But what has me worried is my oddly sour reaction to this Folio article on magazine design. A few years ago I would have been vitally interested. Now it just seems irrelevant. But having just last night downloaded with some interest the December issue of The Atlantic to my iPad, more than a third larger than the Fire, I’m not so sure size is the real problem. Paper pages just don’t translate well to the screen—the turns are slow, images build too slowly, the fonts are too big or too small. You need to enlarge and shrink too often, or tap too many times to get to the better “reading view.” The articles might have been pretty good—but I don’t know. I was too distracted to actually do any concentrated reading. To me, books seem like an eternal format. They work as well for me on a tablet as on a page. But the format to which I dedicated most of my professional career has a poor prognosis in any medium. I fear I will soon be attending a funeral for my old friend, the magazine. 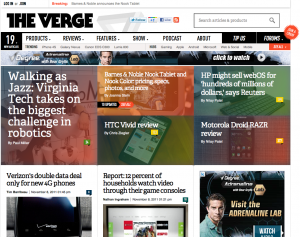 There’s been a lot of excitement in the past week about the new Web publication The Verge. Founded by Joshua Topolsky and several other former Engadget staff, it’s been praised for its dynamic design and for features like StoryStream, which aggregates the site’s content into timelines. But if it succeeds, will it be due to great design, or inherently great stories? Does its future lie in becoming a great destination site, or in creating a unique identity for its content? Though the design, usability, and coherence of site or publication design are still important, they matter less to the success of content than they used to. In an era when content is increasingly atomized and ubiquitous, the identity of that content becomes increasingly important. Traditionally, magazines were a collection of disparate items that relied on the container to give them a coherent identity. But containment doesn’t work on the Web. 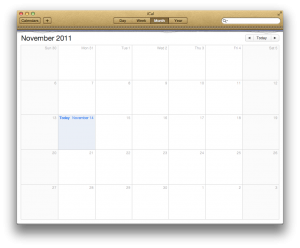 So how then can content serve its publishers? The answer, I think, is that identity must be stamped into the content itself. More than ever, to rise above anonymous commodity content, it must be personal, individual, unique. People must be able to see immediately, for instance, that this content, wherever they find it, could only be from The Verge. The content must be imbued with the brand. It seems to me that this is the biggest challenge for traditional publishers in adapting to new media is to rethink the value of their publications as destinations. Consider, for instance, what Ziff Davis Enterprise CEO Steve Weitzner recently told Folio: about his company’s move to digital-only publication: “”We will publish [eWeek] in the same way—it will go through the same editorial process, the stories will get vetted, they’ll be laid out by art, we just won’t print it or mail it.” Is that the way to go digital? To simply plop the magazine model into a digital space? Somehow, I doubt it. The container doesn’t matter anymore. Only the content counts.